I can’t believe the school year has started again. I was strolling with the baby this morning at 8:00am and saw tons of kids walking to the local elementary school. There was the line for car drop-offs… man that line was long! You know what comes next. Halloween. I started to think about costumes that might work while babywearing OR strolling in a stroller. My kid is walking now, and she really likes the freedom of movement. So if we end up bringing the stroller during our Trick or Treating, so be it! 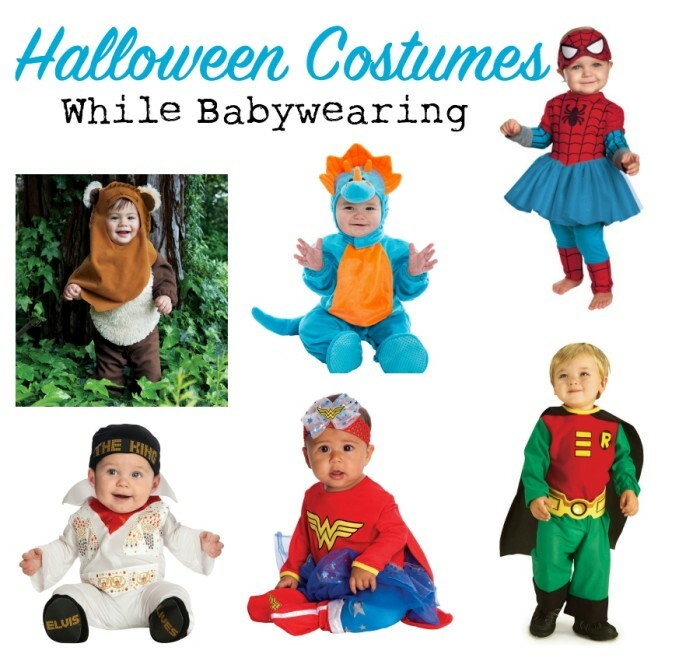 So I’ve compiled a few costume ideas for both baby, wearer and perhaps the stroller too. Ready? Here we go! An Ewok! An R2-D2! (Battle it out against BB-8!) With the new Star Wars movie coming out this year, it’s the perfect time to take advantage of all the fun costumes available! As you may know, we live in Southern California, and I used to work at Disneyland during undergrad. So of course, I had to add my Disney costume picks! If you're not from around here, Disneyland (and I assume Disney World) becomes a little spookier with their Halloween themed decorations. Many guests dress up for Mickey's Halloween Party. Join in the fun with these costumes - easy to wear and also easy for you to wrap - thankfully there aren't a lot of frills to get tangled up in buckles or fabric. Who doesn't love a super hero? The capes of these costumes can go over the back of a carrier, so it won't get jammed while baby is with you. I have seen people use pet costumes to shimmy them on to the carrier itself! That's one way of decorating your carrier for Halloween! What are you planning to dress up as and what will your child dress as for Halloween? ?